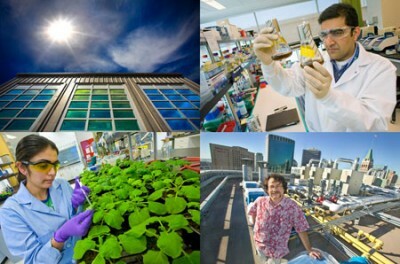 The goal of the Systems Approach to Green Energy (SAGE) grant is to develop a generation of scientists, engineers, toxicologists, policy-makers and business leaders who are well versed in the principles of green chemistry and clean energy. By using a systems approach, the program will foster technology innovations in solar energy, biofuel, and energy storage systems. John Arnold, a professor in the Department of Chemistry, is a Co-PI. Other Co-PIs include Alastair Iles, an assistant professor of Environmental Science, Policy and Management in the College of Natural Resources, and Thomas McKone of the campus Center for Occupational and Environmental Health. He is an adjunct professor in the School of Public Health and a senior staff scientist in Lawrence Berkeley National Laboratory’s Environmental Energy Technologies Division. The SAGE grant team is seeking grad students interested in incorporating green energy research into their graduate studies. They will be recruited from UC Berkeley’s School of Public Health, the College of Chemistry, the College of Natural Resources, and the Haas School of Business. SAGE students will participate in interdisciplinary courses related to green chemistry. They will also be advised by interdisciplinary dissertation committees. The program will also feature K-12 outreach programs to Bay Area schools, and the option of studying at universities in England and Sweden that are developing similar green chemistry and sustainable energy programs.